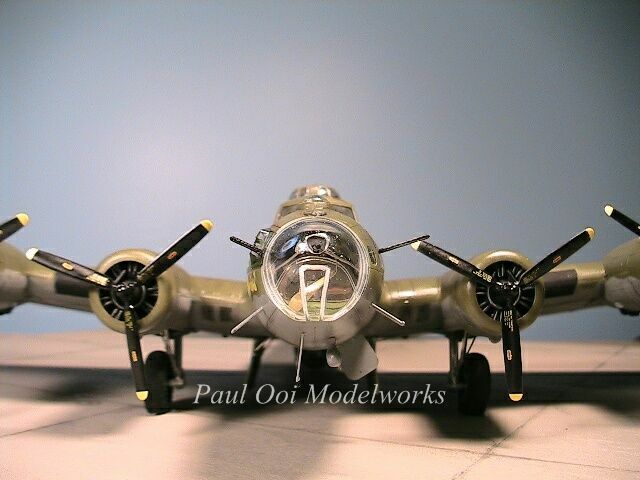 To many plastic modelers, the B17 Flying Fortress is an icon. 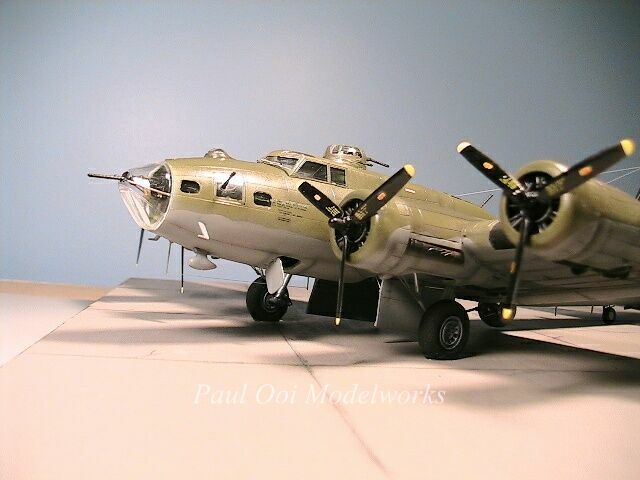 When we were kids, the instant draw of the B17 was its sheer size and the fact that it had more guns and turrets than any other popular bomber of that time or since then. The weekly dose of “Twelve O’Clock High” certainly fed into the mystique. 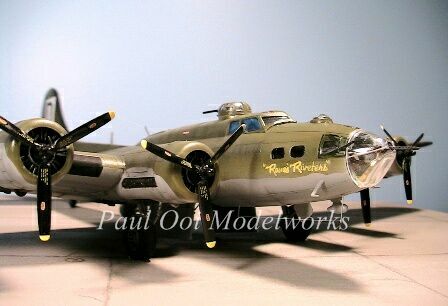 I had since built one B17G for a museum project, and one day I was asked by a private collector if I could build “Rosie’s Riveters”, a modified B17F based on a famous painting by Gil Cohen. 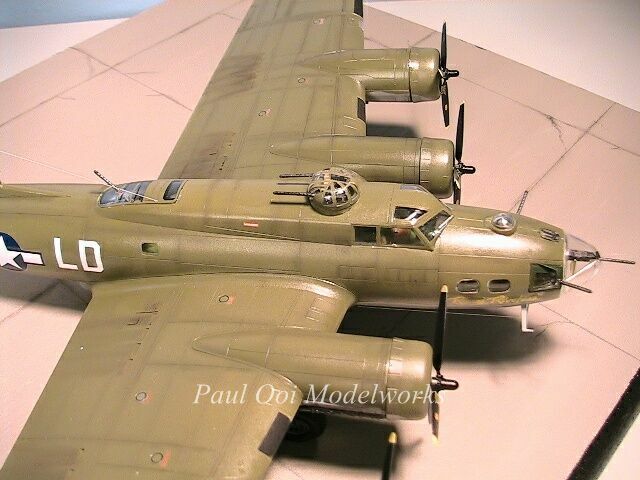 The bird belonged to the 418th Bomber Squadron, 100th Bomber Group based in Thorpe Abbott, UK between 1943 to 1944. There are several interesting challenges to this particular aircraft. 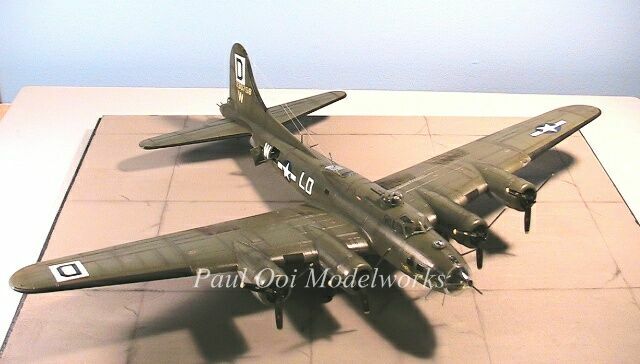 What I initially thought was a straight forward build of a 1/72nd scale B17F Academy kit turned out to be a little bit more complicated upon closer observation. 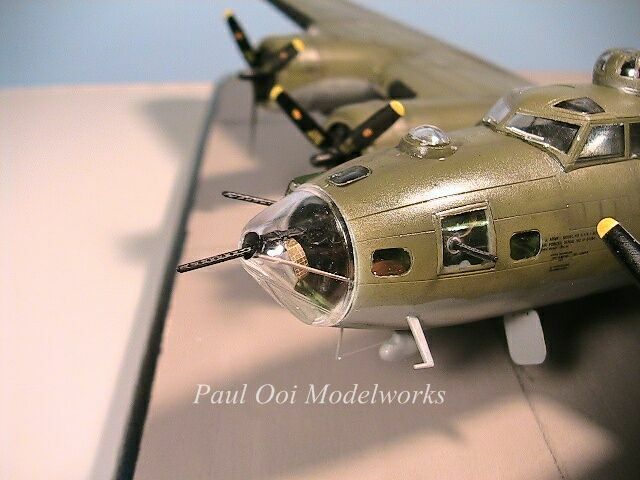 The nose area has a modified side window on the starboard side close to the bombardier that was found in B17G’s but not F’s. This window has a 50 caliber Browning machine gun sticking through it. In addition, the nose cone itself had a field-rigged 50 caliber machine gun sticking through it pointing directly ahead to deter any head-on attacks by Focke-Wulff’s. Finally, there were no after-market markings for this particular unit so I ended up making almost all the decals myself except for the national insignia. 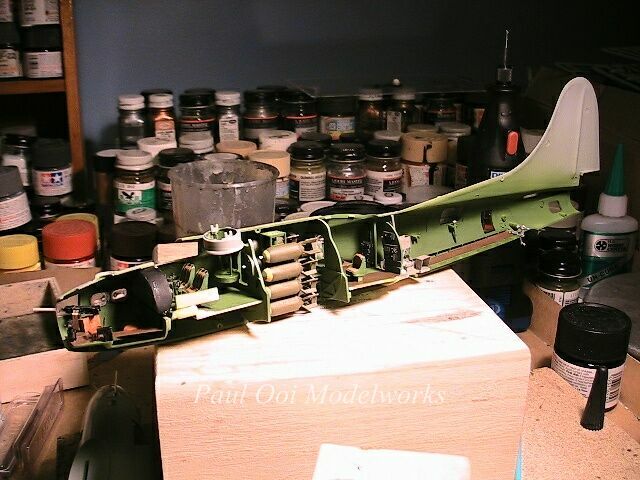 The project started with the cutting out of the waist gun positions, and 3 additional doors in the fuselage (tail gunner, waist gun and radio room, front nose). Given that the aircraft is going to be shown parked on the hard stand, the hydraulics will release the flaps and reveal the internal ribs. I start by cutting away the flaps molded to the wings. These were replaced with photo-etched flaps and ribbing. The cockpit and interior was a mixture of Legend resin parts and Airwaves photo-etched details. The whole interior section took almost 2 months of work. The gun positions were the trickiest, especially the ball turret assembly and the top gun turret immediately behind the pilot. 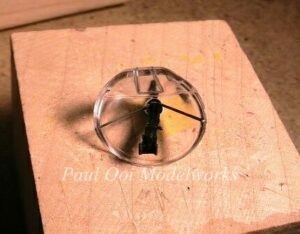 The nose section had gun positions for the bombardier and the navigator, all crammed into a very small space that was going to be visible through the clear plexi-glass cone. Finally the aircraft fuselage halves and wings are “sealed”. The rear gunner’s compartment is a thimble sized sub-assembly that gets attached on to the main fuselage. The nose cone was carefully drilled (yikes) and the surrounding area carefully machined to re-shape to make the rubber boot that fitted the gun housing. Metal reinforcement rods were also attached on the inside that formed the supports for the 80lb 50 caliber Browning. 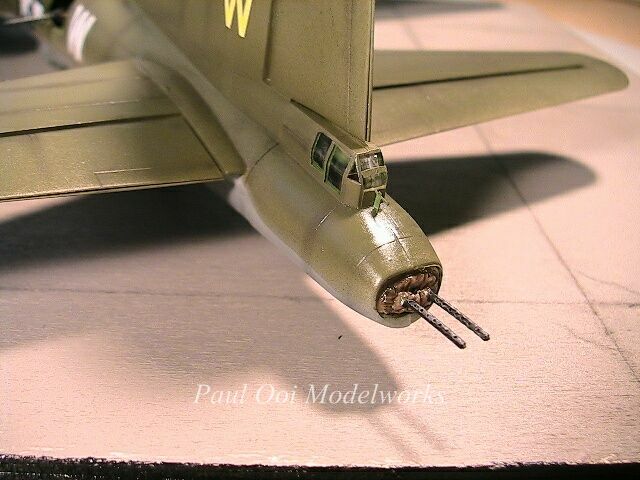 There are many ports and holes to seal in this aircraft for the airbrushing ahead. Many small windows are masked and I left off the large plexi-glass cone until the body colors have been applied. 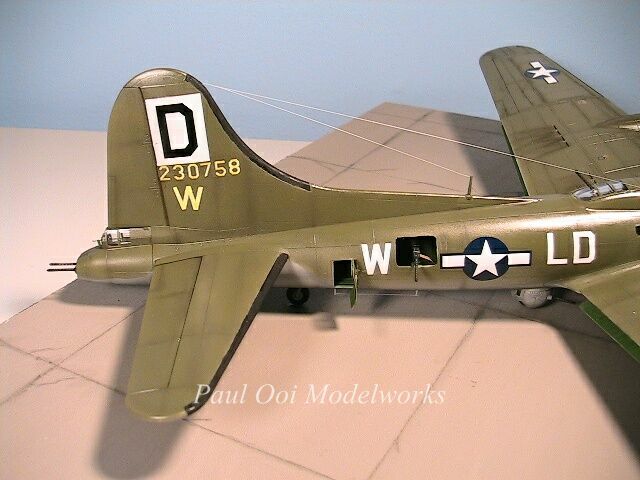 The underside was medium grey while the upper body was olive drab lightened a few shades. The paintwork was sealed under several layers of clear varnish for the decal application. The unit markings were custom-made printed decals while the signature nose-art “Rosie’s Riveters” in yellow was done with a special technique using hand-painted artwork. Finally, the hard stand base was prepared and Rosie’s Riveters gets a smooth landing on the tarmac! Enjoy the pictures! The flying T-rex, the biggest baddest bird in the sky! My father flew on this plane. He would have loved your work! I am honored that you recognize the replica. It is in remembrance to the brave men who took to the skies like your father that this hobby gives me so much satisfaction. What would it take to get another one or two of these made? I think Dan Rosenthal would love one (Rosie’s son), and my brother Bob in California. My father Jim Mack was a waist gunner on this plane. You are very talented and he would have loved this model. Sharon, was he part of the Robert Rosenthal crew? My Dad Ray was the ball turret gunner. We still have his jacket. Paul, you make me and my father, SSG Ray H Robinson, Ball Turret Gunner on Rosie very proud. My brother still has his jacket with all the painted missions. Email me back and I will send you some photos. Also, on YouTube, there is a video called, “Bloody Skies over Dresden, 100th Bomb Group it is a Discovery Wings show. The opening shows a big silver B-17 and the voice says, “Ain’t she a beauty? A real work of art,” from the inside of the open waist door, a older gentleman steps in. Surprise, it is Robert “Rosie” Rosenthal! The photo of the crew is about 19 minutes in. My dad is the short guy on the right with the big grin. Had to be little to fit in the ball. Oh, the ball was held in place by a single steel cable so it could turn. I was shocked, but my Dad Ray said this was fabulous, as the steel cable would deflect if hit by flak, so they did not lose the ball at 29,000 feet.